I'm a landlubber spending two days in South Beach between the end of a cruise and the beginning of a vacation in the Virgin Islands. I do not have kids with me, and I'm looking for things to do that will speak to my interests in new cultures, art and architecture, and gardening. I wonder if this is even feasible here if you're not enthusiastic about watersports and sunning in the sand. But I learn that Miami has it all—a cosmopolitan flair, cultural intrigue and lively entertainment, and you can feast on stone crabs, plantains, empanadas, mahi mahi, mangoes and yuca. Not only that, it's the cruise capital of the world and the home of the Miami Heat, the Miami Dolphins and the Florida Panthers. What else can you ask for? I buy a two-day ticket for the hop-on hop-off bus and am able to make my way to all of the areas and sights described here. 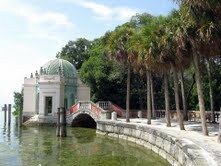 And there's so much more to explore here in Miami. I'd like to come back. Centered in South Beach on Ocean Drive between 5th and 15th avenues, this is where to see the Miami Modern (MiMo) style of architecture Miami Beach is famous for. Iconic pastel hued buildings from the 1930s stand side-by-side like a sherbet rainbow. 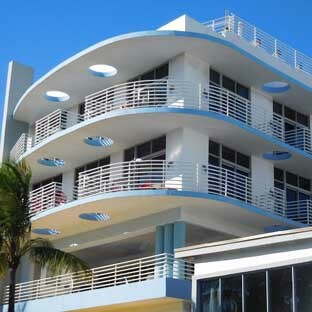 There also are stunning buildings on Collins Avenue which runs parallel to Ocean Drive and is where I am staying. 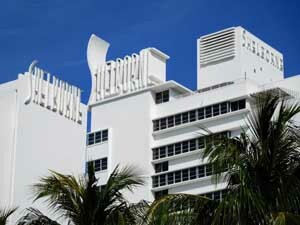 The Delano South Beach Hotel (below) is one of them. At 1685 Collins Avenue and next door to the Ritz, it is the epitome of luxury. Soft sheer curtains hang from the ceilings and blow in the breezes that come in from the bay just outside the door. Sumptuous Art Deco furnishings decorate the lobby areas and the iconic Rose Bar where you can stop for a pre-dinner drink. Out back is the pool with its stark white cabanas and lounge chairs, and there's a unique display of interior furnishings such as beds and chess tables under the trees and on the lawns. There is no doubt that R&R is on the menu here. Ocean Drive and Collins Avenue are hopping at night. Neon greens, blues, oranges and purples reflect off the pale building exteriors, sidewalk cafes are bustling with diners eating under the neon glow, and there are plenty of opportunities for entertainment. The historic Betsy Hotel has a jazz pianist in its cozy lobby bar, and you can take a salsa class at one of the area's nightclubs. Little Havana satisfies my cultural curiosity. Its main thoroughfare is Eighth Street, the ethnic and political center of the Cuban people living in Miami. Cuban immigrants migrated here in the 1960s and it is in this area where you can enjoy Latin music, cafecito and hand-rolled cigars. A walking tour of Little Havana is included in the ticket for the Big Bus Hop-On, Hop-Off bus. I stop at the Ball & Chain at 1513 S. W. 8th Street for a drink and some tapas and to enjoy the Latin music and dancing that spills out onto the sidewalk. This club has a storied past of gambling, bootlegging and felons but today you'll mostly find camera-toting tourists and dance enthusiasts. This historic home-turned-museum at 3251 S. Miami Avenue is the former winter home of billionaire and industrialist James Deering, founder of International Harvester. It is an opulent European-inspired villa with thirty-four rooms that are lavishly filled with art and antique furnishings. Just as beautiful are its extensive bayfront gardens, lush with plantings, pools, fountains and statuary from Italy and France. 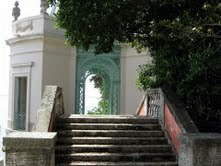 Villa Vizcaya was built in the early 1900s and was designated a National Historic Landmark in 1994. I have a bite to eat in its appealing cafe and shop for souvenirs in the upscale gift shop. 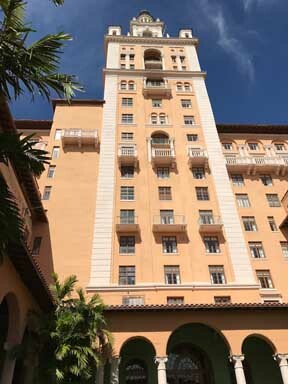 A premier destination at Anastasia Avenue and De Soto Boulevard in Coral Gables, this “grande dame” was built in 1926 by the founder of Coral Gables, George Merrick. It served as a military hospital during and after World War II, and later became the first home of the University of Miami. In the 1980s, the City put $55 million into renovating and restoring the hotel to its former glory and today it is on the National Registry of Historic Places. I spend time sitting in the lobby drinking lemon-infused water and admiring its spectacular hand painted ceiling and old mahogany service desk and elevator banks. This formerly bleak warehouse district is now trendy Wynwood, transformed by the graffiti and street art that have been painted on warehouse walls and storefronts by some of the world's greatest artists. The project was conceived in 2009 to revitalize a run-down, dark and dangerous area. An especially concentrated area of the art is located between NW 2nd Avenue and 25th Street and is best viewed from the upper level of the bus. This has been called a “museum of the streets” and represents the urban graffiti and street art genre at its finest. 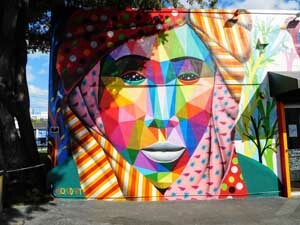 I get off at the Wynwood Walls stop and spend time admiring the concentration of wall art in this block. On the Uptown Loop in Wynwood, the bus stops here for a few minutes for refreshments and a look at some of the finest customized vehicles in the world. 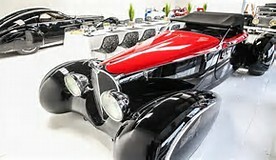 This is an event venue that was founded in 2015 as “the world's first auto art gallery and gourmet dining experience”. Inside the gate is a curated collection of luxury cars that have been created by founder, owner and designer, Elo. Elo is British born and owns over 200 cars, the vast majority of which are in his London Motor Museum in the UK. This poignant, soul-stirring monument by sculptor Kenneth Treister is located in the South Beach area at 1933-1945 Meridian Avenue. It consists of a circular reflecting pool and a towering 42-foot high bronze sculpture of an outstretched arm. Naked people cling to its base, reaching up and crying out as though to escape the horror, and there is a photographic mural of the death camps and a Memorial Wall with the names of victims. 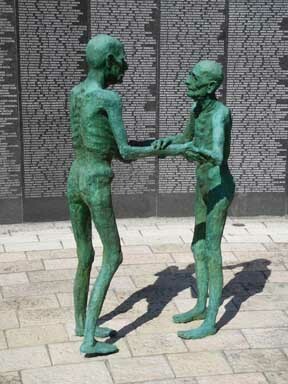 It is a powerful reminder of the six million men, women and children who were exterminated by the Nazis. These secluded South Beach gardens are right next to the Holocaust Memorial and the reason why I am visiting them. They are not easy to get to because all around are busy roads and construction equipment for the demolition of the convention center. But once I find the three-acre oasis, I am enchanted. 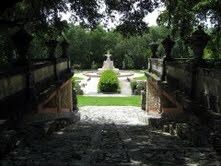 The gardens were founded in the early sixties and transformed in 2011 with a $1.2 million renovation. 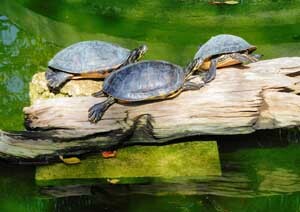 They showcase native Florida plants and trees and include water gardens, stone lanterns, statuary, and chairs for lounging on the Great Lawn, and there's an abundance of birds, geckos, butterflies, fish, caterpillars and other wildlife. This is an enjoyable respite from the hustle and bustle of nearby South Beach. 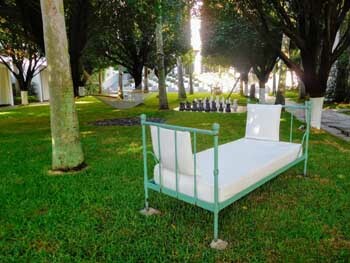 •	Shelborne Hotel, 1801 Collins Avenue, Miami, FL 33139; 305-531-1271. 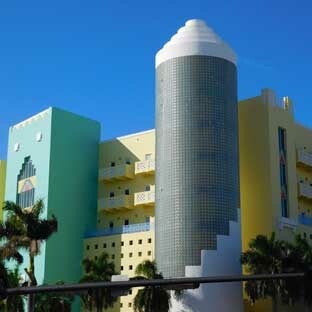 This is a lovely hotel located near the luxury hotels in South Beach, but you can get bargain prices for some of the rooms using a AAA membership card. 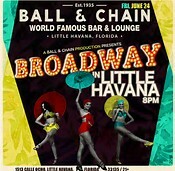 •	Ball & Chain restaurant and nightclub, 1513 SW 8th Street, Miami, FL 33135; 305-643-7820; ballandchainmiami.com. 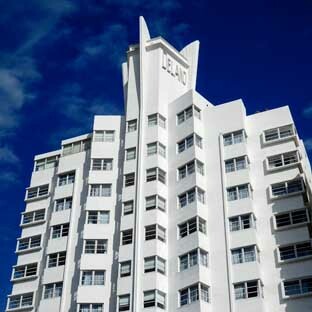 •	Art Deco Welcome Center/Miami Design Preservation League, 1001 Ocean Drive, Miami Beach, FL 33139; 305-763-8026. Tours of the Art Deco District start here. About the author: Elizabeth von Pier loves to travel. After she retired from her lifetime career in banking, she started traveling, photographing, and writing. She has been published in In the Know Traveler, Go Nomad, Wave Journey, Hackwriters, Travelmag—The Independent Spirit, and Travel Thru History.